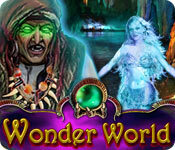 Help Jessica save her husband’s soul in the hidden object adventure game, Wonder World! A medallion banishes Jessica to a strange world where she must defeat the witch who stole her husband’s soul. Partake in a journey that takes you from the ordinary world, to a land of adventure and wonder.